Michael Muir has bred horses since 1965, for more than fifty years. He developed the Stonewall Studbook to record the pedigrees of the unique kind of warmblood he developed from his race and showhorses crossed with modern champion Percherons. The heavy draft crosses eventually evolved into the American Sugarbush Harlequin Draft Association, under the direction of Everett Smith in Willowood, Ohio and now managed by Tracy Meisenbach and Bron Stark in Brookneal, Virginia. The Stonewall Sporthorse was bred away from its Percheron origins, using selected crosses of European warmbloods to develop the modern type of Stonewall Sporthorse we produce today. 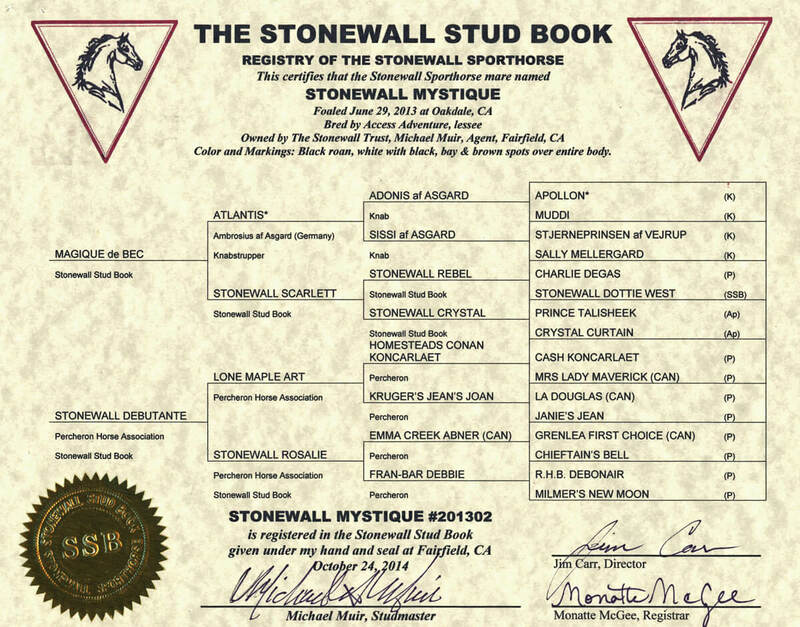 The Stonewall Studbook is recognised by a number of registries around the world, including the American Warmblood Registry, Friesian Blood and Baroque Horse Registry, Friesian Sporthorse Registry, International Patterned Sporthorse Registry and others. In addition to recording the pedigrees of the horses we breed at Stonewall Stud, we also record horses descending from our families produced by other breeders, as well as unrelated horses of approved sporthorse type. You are invited to record your Stonewall Sporthorse in the Stonewall Studbook, or submit your prospect for evaluation and registration. Click below to download Applications to Register and Transfers of Ownership.